COOLDO Box heat treatment furnace is a flexible single chamber furnace designed for meet many processing requirements. The Box Furnaces are used for normalizing, annealing, quenching, tempering, hardening and other high temperature thermal processes for carbon steel, alloy steel, high-speed steel and other metal parts with different heating method in electric, direct fired or indirect gas fired. 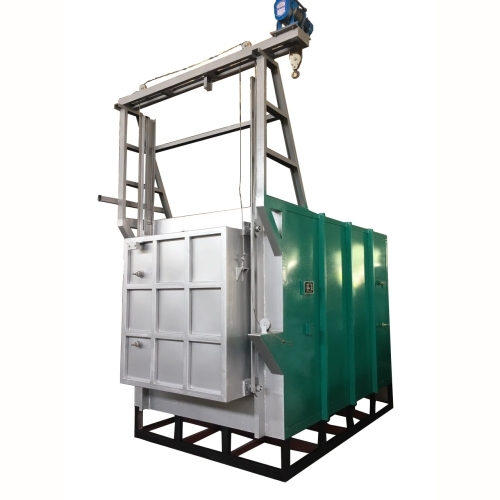 The Box Furnace can be desgined a vertical lift or swing out door allowing the various sized product(s) to be placed in the furnace, that can be customized to meet many processing requirements. Multiple zone heating technology can be integrated to maintain exceptional part temperature uniformity, and achieve heating and cooling profiles. Chamber structure: All use the Ceramic fiber insulating systems, Alos can be incorporated within the special design of atmosphere protection. Heat Method: Provided in electric, direct fired or indirect gas fired for specific processing requirements. Furnce door: The frame made by steel plate, two styles of door are vertical lift and swing out. Heating Efficiency: Specially-designed furnace door sealing, and built-in heating wire ensure excellent sealing performance and uniform furnace temperature. Protection: Equipped with all kinds of interlock protection device, which can prevent Failure and accident due to misoperation. 1).Adopt ceramic fiber, greatly shortening starting heating time and extraordinarily saving energy up to 20%-30%. 2). Specially-designed furnace door and roller sealing, and built-in heating wire ensure excellent furnace door sealing and uniform furnace temperature. 3). Double-thermocouple control: one thermocouple is for testing furnace temperature, and the other one is for over-heat protection. 4). The furnace is equipped with interlock protection device, which can prevent Failure and accident due to misoperation. 5). Adopt intelligent digital temperature-control system, which feature clear reading, conveniently adjusted, high temperature control precision, easy structure, safe and reliable.